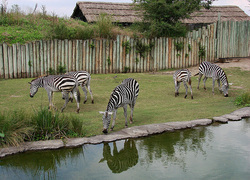 How does energy provide food for zebras? The plants absorb the sunlight containing it making it in to sugar. And at night where there is no sunlight the plant must store the energy and the zebras come and eat the plants giving them energy.